Cuisinart 5-in-1 Griddler Just $60! Down From $185! PLUS FREE Shipping! 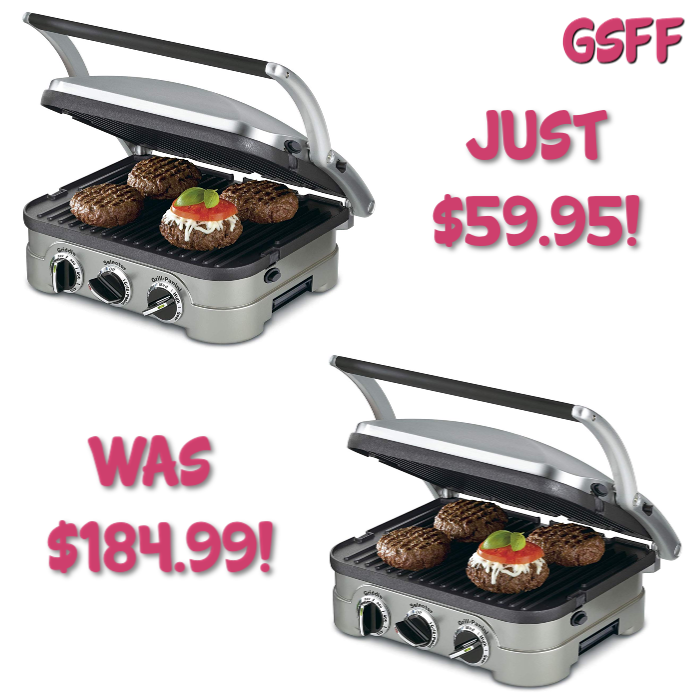 You are here: Home / Great Deals / Amazon Deals / Cuisinart 5-in-1 Griddler Just $60! Down From $185! PLUS FREE Shipping! Don’t miss your chance! Amazon has this Cuisinart 5-in-1 Griddler for just $59.95, down from $184.99, plus FREE shipping! The Cuisinart 5-in-1 Griddler can handle everything from pancakes to sauces to grilled cheese, steaks, hamburgers, and Paninis! With 5 different cooking options and reversible grill and griddle plates, you can easily cook an entire meal! There are no complicated buttons or controls to use: The selector knob lets you choose the grill or griddle function and has adjustable temperature controls. The red and green indicator lights let you know when your Griddler has reached your desired temperature and is ready to cook. 5-in-1 countertop unit works as a contact grill, panini press, full grill, full griddle and half grill/half griddle. Removable and reversible dishwasher-safe nonstick cooking plates drain grease for healthy cooking; integrated drip tray.